Rails Have Successful State Meet! The Rails had a great state meet! The divers kicked things off on Friday (11/3). 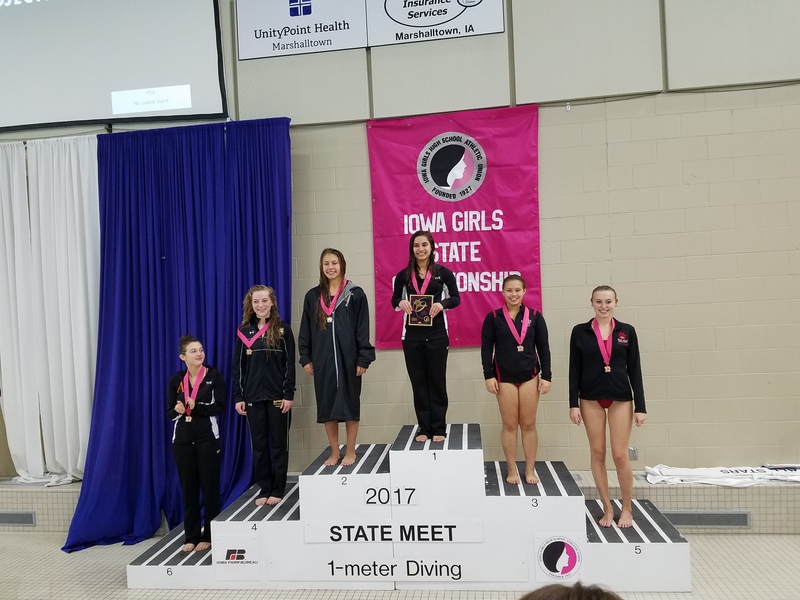 After 11 rounds and some of the highest cuts in State history, Jolynn Harris finished her senior year as state runner-up! Meanwhile Chloe Pearson, sophomore, finished 9th overall! She made both cuts and moved up 10 spots from her seed in her first state appearance. She also earned her 400 Point Club shirt with her score of 430.30! The swimmers took their turn Saturday (11/4) after a two year drought. It was awesome to see the swimmers to qualify two relays and two individual events. The medley relay started off by winning their heat and moving up 2 spots to 17th in the State. Chloe Marquis raced to 15th in her 10o Fly with her final time of 59.37. The sprint relay took 21st overall and Chloe took 23rd in the 100 Back. In the end, the team finished 17th at the State meet. That’s the highest finish in Coach Weber’s tenure – all with only one senior. Learn more about this season’s amazing milestones by reading the Season Summary.